You will love Visual GLCD! We in MikroElektronika always try to save your development time by making the hard work automatized and offering hardware and software that work in harmony. When we were in the process of writing GLCD libraries, we figured that it was taking too much time to build high-quality graphical applications, and that the most of the process is not so flexible and intuitive. That’s why we began to work on a project to build a rapid development application in the form of a graphical vector editor where anyone can easily create complex and fully functional GLCD GUIs with just a few clicks. We now present you with the Visual GLCD - the first software of this kind, where you can enjoy designing GLCD applications without worrying about the code. 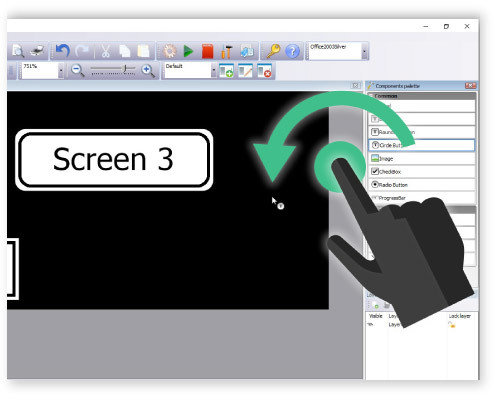 The Visual GLCD drag-n-drop development environment enables you to spend less time programming, allowing you to focus on functionality and design. Grab the object you need and simply drag it to the location of your choice. Move things around until you are satisfied. Introducing touch-screen input with GUI in your device, will open a whole new potential for user’s interactive participation. 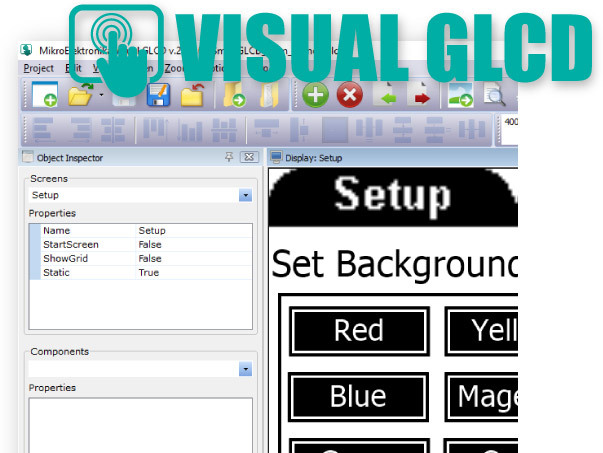 Visual GLCD implements functionalities that empower you to handle touch inputs easily. Navigate the screen faster, do more than before. 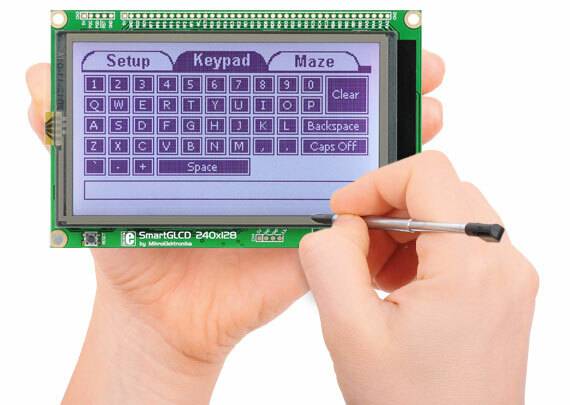 Visual GLCD supports the most common GLCD controllers and display sizes. See the table below for more information. The following microcontrollers can be controlled over SPI as well: KS0108, S6B0108, NT7108C, T6963C, RA6963. Nobody likes complicated settings and options at the beginning of each project. With new hardware templates, single click on a dropdown list item does all the work for you. Everything will be automatically set. The interface is simple to use, you'll feel like you are using any other vector graphic editors. We’ve mixed functionalities from the both worlds: the world of design and the world of programming. 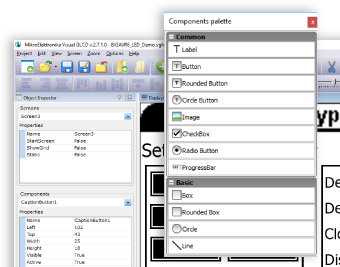 There are several palettes of the most useful components that you can use in your application. Just drag a component into a pixel grid display screen and it will be drawn instantly. Use the Object Inspector to edit component properties and to assign desired events. Do you need more space for your images and fonts? Do you want to create image slideshows, or to even play a video from MMC/SD Card? With new Resource file feature, Visual GLCD software brings you all this and much more. If this option is selected, after code generation, Visual GLCD will store all of your images and fonts in the resource file and will optimize them as much as possible for faster utilization. You just have to copy that file onto your MMC/SD card and you are ready to go. 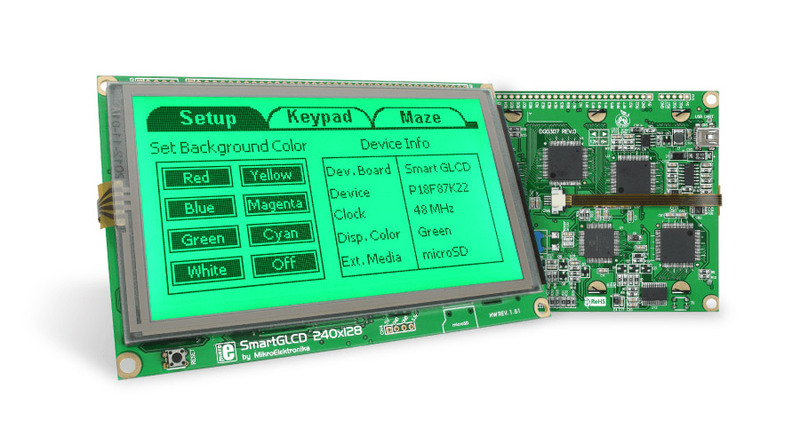 Visual GLCD supports a wide range of development boards from MikroElektronika, so you’ll have all the hardware you need to get started. Each board has a hardware pattern, a configuration template with hardware connections for GLCD and touch-screen so you can achieve all the necessary settings with a single click. 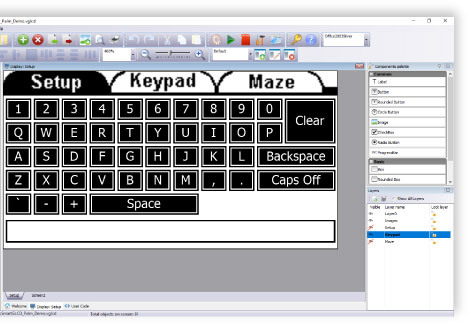 Design fantastic GUIs for SmartGLCD in Visual GLCD software with ease. Even if you are a total beginner, you’ll be able to create amazing applications. After you’re finished with the design, there’s no need to worry about the code - source code generated by Visual GLCD will be integrated smoothly into your favourite MikroElektronika compiler. 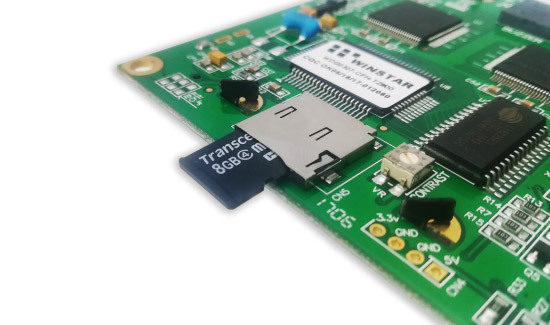 The perfect companion for Visual GLCD is the SmartGLCD 240x128, a full-featured board for easy development of embedded graphical application using PIC18F87FK22 microcontroller. 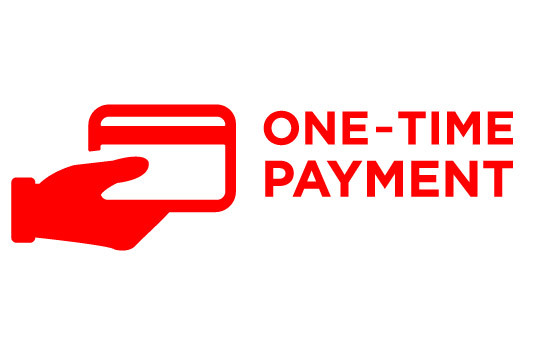 Pay once and never worry about it again. Once you buy Visual GLCD you are entitled to a lifetime of free upgrades. Upgrading the software takes only a few minutes and a few clicks. We are constantly adding new features, and you can keep track of what is happening on the Software Roadmap tab. Our support team is always available – you can rely on our help while you are developing. The software license guarantees free product lifetime technical support. 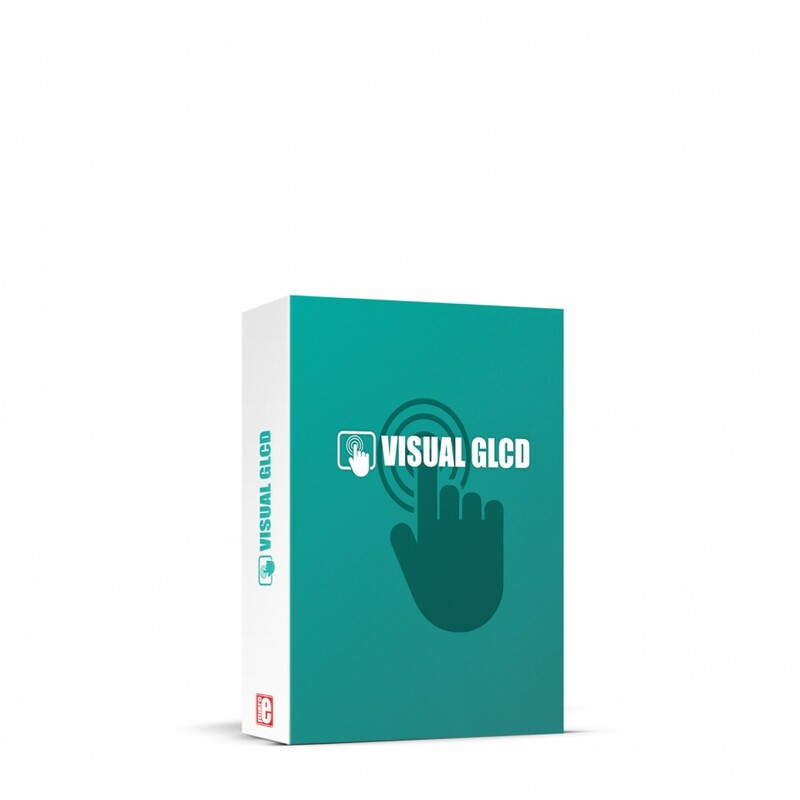 Buy the Visual GLCD and the License Code will be sent to your inbox instantly. Once you activate the license you can use it on up to two computers. Do you need a portable license, that can be used on multiple computers? USB Dongle license is the perfect solution. You can organize your project into several screens. Each screen can be one application or a container for one functionality of your application. Easily traverse through screens and organize components as you desire. With zoom feature, screen grid and easy manipulation of content, screens are really easy and pleasant to work with. These 12 components are all it takes to create what you imagined. We have made dozens of great projects of different complexity. Each component has it’s own properties: standard fills for boxes, different fonts for labels and buttons, positions on the screen, visibility, activity and more. Each one supports standard events, such as OnClick, OnPress, OnDown, OnUp. In Object Inspector you can easily manage multiple screens and edit your component in practical and easy way. You can enter data relevant to your project such as Component name, Distance, Width, Height, Caption, Font etc. Edit components events and bring them to life. 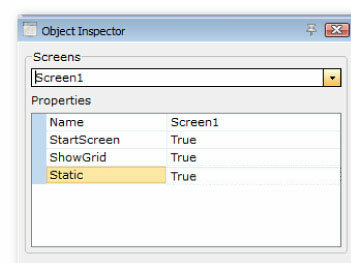 Object inspector is elegantly designed and intuitive tool for rapid development. We all know how annoying it can be to set the configuration and all the hadrware settings each time we start a new project. This is why we have come up with a solution that saves your time. 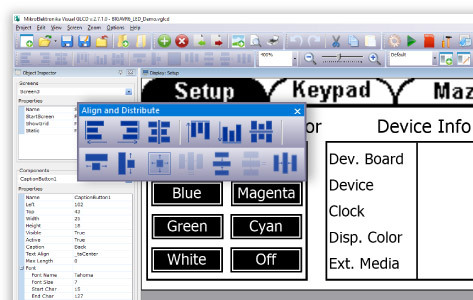 With Options window, you have hardware patterns for every supported development board, and one click on the item from the list does all the job for you. 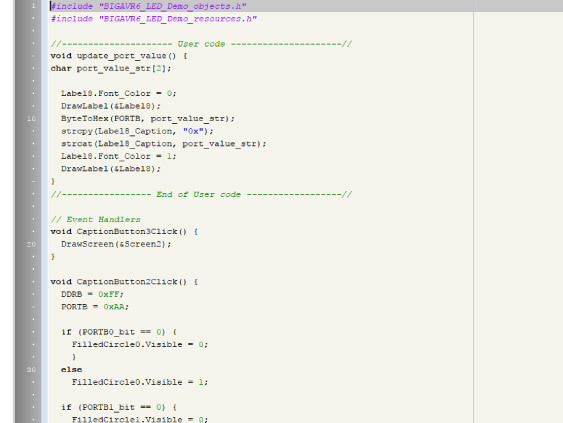 User code Editor features syntax highlighter for mikroC, mikroBasic and mikroPascal, it features line numeration and can be used to write your user code, in the Visual GLCD software itself. Let’s say you want to make a first keyboard row of 10 keys? Draw one, duplicate it 9 times, place first and last in the right positions, and use align and distribute tool to align them all to top, and distribute them evenly. Entire thing is done in seconds. Visual GLCD supports layers in your design. This way you can logically group components as in any other vector editor. Being able to specify layer position and visibility, as well as to lock layers will help you a great deal in your design. Check out the Roadmap and see what we improved in each version of the Visual GLCD software. New Board Definitions! Added: Support for EasyMx PRO v7 for Tiva. New Board Definitions! Added: Support for EasyPIC Fusion v7. New Board Definitions! Added: Support for EasyAVR v7. New Board Definitions! Added: Support for SmartGLCD v1.51. 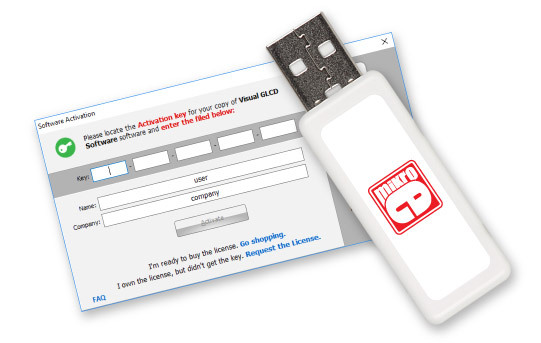 Improved: Software licensing via mikroE Dongle. Improved: Software Activation page improved, as well as the Check for Updates. Fixed: New object enumeration after drag&drop. Fixed: hanging MCUs ARM families didn't refresh GLCD connections. New! Live update introduced for Visual GLCD. It is now possible to update to latest application exe, dll, boards def versions, help file etc. New! Resource collection introduced. Add numerous images and fonts to your projects without adding a single object! New! Code generation support for ARM compilers (Stellaris and STM32). New! One Pixel Space checkbox for backward compatibility. New! Added slider on Zoom Toolbar to more easily zoom screens. New! Corner Radius property added to rounded button to customize roundnes of object. New! Added checkbox for turning off message about successful code generation. New! Added routine combo box list in object inspector. Now it is possible to assign one handler function to different (multiple) objects. New! New object Radio Button. Improved: Button, RoundButton and Circle Button got new property: TextAlign Now it's possible to align button caption to left, center and right. Improved: Visual GLCD is now able to generate board definitions from project file, when specific definition is missing or new. Improved: Visual GLCD detects changes to Board definition from Options and offers to save under new name. Improved: Image object do not need PicturePath property anymore. Export Project Option will now be deprecated. Improved: Old welcome screen replaced with new concept like in mikroE compilers. Improved: IDE response when selecting multiple objects. Improved: All Font properties are now available for changing from Object Inspector. Improved: User can select any combination of Font styles. Improved: Import project handling of Visual GLCD projects from different versions. Improved: Board definitions are now stored in separated files instead of big one "Boards.xml". Improved: Code generation gives warnings if some of the necessary fields (Options->GLCD and Touch Panel Tab) have not been filled. Improved: Visual GLCD generating T6963C routines for EpsonS1D13700. Improved: Width of Label in design time changed to fit text width. Fixed: Empty caption on static objects results in error while compiling code. Fixed: String literals and escape characters causing errors when compiling code generated from Visual GLCD. Fixed: Generating code failed when one event handler is associated to multiple objects - event multiplayed. Fixed: Visual GLCD generates Calibrate procedure even if Touch Panel is disabled from Options window. Fixed: Visual GLCD generating, in certain cases, T6963C routines for EpsonS1D13700. Fixed: Visual GLCD generates, in certain cases, GLCD connections for T6963 and Epson S1D13700. Fixed: Certain fonts not displayed correctly on display screen. Fixed: Font names with invalid identifiers generate code that can't be compiled. Fixed: Pasting objects on empty screen caused IDE to crash. Fixed: Closing project while still saving causing IDE to crash and loosing events code. Fixed: Including group object type in align cause IDE to crash. New! Code generation support for PIC32 compilers. New! Multiple fonts supported. No more page font draw limitation. Font size is no more limited. New! Multiple font styles supported: Regular, Bold, Italic, Bold Italic, Underline, StrikeOut. New! Static property added for screens and objects (Saves RAM = more Screens and objects available for your disposal). New! Added support for External Memory (MMC, serial EEPROM/FLASH...). New! Added Extern Memory Selected bar for easier work with resource file generated by Visual GLCD. New! Added Extern Memory button. 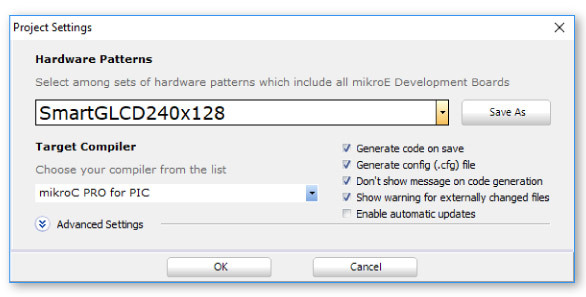 Set up your mikroElektronika board to work with MMC in a single click. New! Added Align and Distribute Toolbar. Easily move, align, resize multiple object and much more. New! OnPress/ release draw procedure simulates "object pressed" action. New! Welcome screen. Quick shortcuts to recently used projects. New! Double click on component event in object inspector leads to event handler function code. New! Visual GLCD now generates header style comments about project in projects main file. New! Multiple select of objects displays values that are the same (for the selected objects). New! 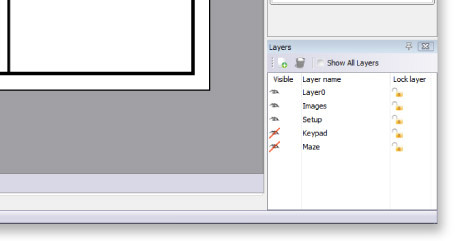 Layer system introduced (like in PhotoShop). New! Object align and distribute options. Easy arrange and distribute objects on screen. New! Zoom in/out option for each screen. New! Print and print preview of current screen. New! Added Line numbering for user code. New! Added "Tip of the Day" feature, with some useful tips and tricks on how to make the most out of your Visual GLCD. Improved: Project Settings completely rearranged and improved. Improved: All project related info (connections, TP settings, Initialize routines etc) are now saved into Visual GLCD project file. Improved: Copy, Paste, Undo and Redo functions enhancement. Improved: Complete code refactoring. Visual Glcd now generates smaller routines and more compact code. Improved: New Project wizard improvement, application now generates message if some fields Connections/GLCD/Touch Panel are left blank. Improved: Screen properties (Orientation, Show Grid and Grid Color) moved from Options window to Object Inspector. Improved: OpenProject: Drag 'n' drop project file to open it. Improved: IDE stability while saving, opening and exporting projects. Fixed: Highlight an object and scroll down, the red box is misaligned. Fixed: Misalignment makes it impossible to drag objects to the top or bottom of the screen. New! Examples to cover new released boards. Improved: All examples converted and redesigned in new version of Visual GLCD.